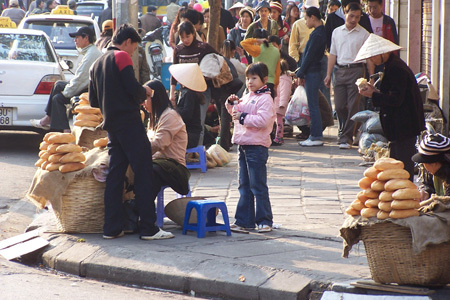 Below are some thoughts and reflections from our trip to North Vietnam. North Vietnam: what words describe this place? Noisy, crowded, alive, energetic, dirty, poor, beautiful, friendly, diverse, polluted… I think it’s the mixture of 2 worlds that is hard for a westerner to understand. A land moving from a third world nation under Communism, striving toward Capitalism with one foot in the past, a body in the present and the other foot in the future. 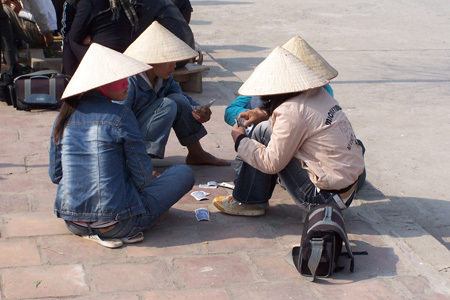 First Laugh: changing our money at the airport – for $100USD we receive about $1,500,000 VND – everything costs 1000’s of VND which, of course, is just pennies. Interestingly, everyone here will accept USD as well as VND. The basic unit of currency is called the Dong. First Impression of Hanoi: motorbikes and horns – the roads alive with swarms of bikes like minnows – darting and dashing in and around in a crazy yet fluid dance. People drive pretty much on the right side of the road (with a few individuals who are always looking for a more interesting possibility to get where they need to go – including sidewalks), but traffic lanes are non-existent. The bikes ride 10 abreast, moving and swaying, in and out, speed up, slow down along with the occasional car, bus and numerous pedal bikes. Anytime you make a movement on your bike – speed up, move to the right – you have to let the others around you know that you are moving so you use, you guessed it – your horn. There is a constant cacophony of squawks, squeaks, and beeps of every variety of horn. Apparently the motorbike trend has gotten much bigger as the economy has improved and as cheap bikes are now manufactured in China. EVERYONE has a bike – the very pregnant girl at the hotel lobby desk, mothers with children, old women, families of 3 are common on a bike. 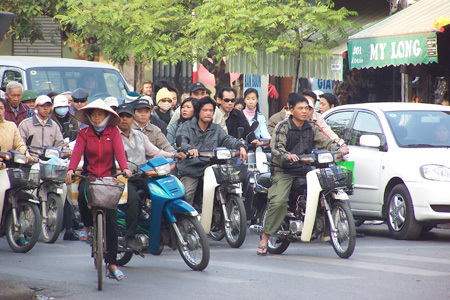 There are “taxi” bikes – just climb on the back and they’ll take you where you want to go. Picture an intersection (many without traffic lights, many multi-faceted with 6 or more roads coming together), a couple of hundred bikes all honking and maneuvering in and out and around each other, some cars, a bus, 20 pedal bikes, some pedestrians crossing the road, and watch this amazing tapestry weave itself together. What astounds us over and over is that it works! 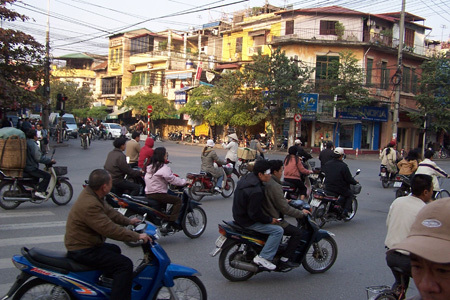 The rules for crossing the street are – hold hands if you have a partner – take a deep breath – watch very carefully – and WALK SLOWLY and steadily – the bikes maneuver around you and we are again amazed each time we find the other side of the street with relative ease – what looks impossible at first can actually be done. But boy is it scary at first! The street pollution is astounding – most riders wear masks, but the thought of doing this everyday is hideous. The one thing that made me squirm inside was seeing a mom and 2 children on a bike – the little one in front and the ‘older’ one on back – the older in a bright orange jacket couldn’t have been more than 3 or 4 years old and looked as if he/she were asleep on the back of the bike – how easy to fall into the maelstrom around… But some people have little or no choices… We actually took motorbike taxis twice and really become a part of the chaos – words just can’t describe. Worlds: we hear the terms third world country, developing nation, second world country. How to classify this one? A bit of everything, I think. We were not prepared to see so much of “rural China” here – I think we expected it to be more like Thailand. There is the starkness of dark and dirt as you move outside the city - many people live in what looks like a dark and dirty garage. Shops are the same “garages” of cement – no color – no decoration – just some shelves put in for wares. Yet, some of these shops will be selling cell phones, or wedding dresses (these in glass) and another is an Internet café with video games. The mix is hard to imagine. This is an outdoor people – city or village – cooking outside on the street, sitting, visiting – maybe because inside is too dark, dreary and cold. There are no franchised western restaurants or fast food places here – Pepsi and Coke, yes but not much more. 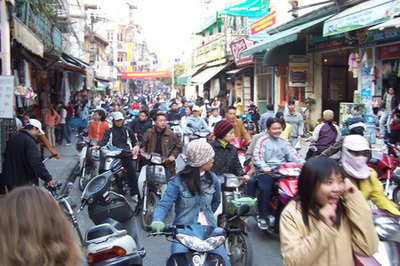 Many city businesses take place on the sidewalks (haircutting: just set up a chair on the side of the road), or flow from the small shop out onto the sidewalk – motorbike repair, gravestone cutters, small restaurants… There are literally thousands and thousands of small shops endlessly lining street after street – how do they all make money?? On one stretch of city street you’ll again see this mix of worlds – many poor “garage” looking shops alongside a redone shop selling high price clothing. Remembering where this country has come from – a continuous past of invasion and war – just to mention a few - from China to France to the US, it is growing and moving forward with determination. Hotel: at first glimpse a beautiful structure on the older side (3 stars) – high ceilings, balconies, beautiful archways – spotlessly clean, friendly and helpful staff. It is a big ‘conference’ center and this is “Wedding Season”. Each day since we have been here there are been 2 weddings with happy celebrants, food, pictures, confetti and brides in western traditional white dresses – with “Here Comes the Bride” music! A conversation in the lobby with one of the guests (people always want to talk with us and to know where we are from) reveals that many of the wedding customs here are similar to those of the west. Countryside: hard life, beautiful surroundings. 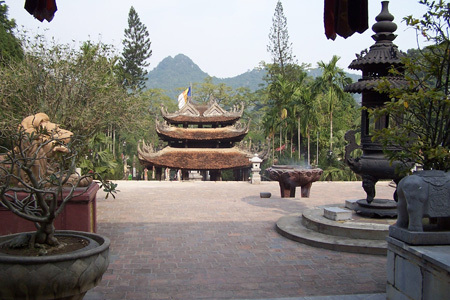 We take a ‘day tour’ to see the Perfume Pagoda – we have a private tour which includes our car and driver. We drive an hour and half south of the city – all the time weaving and maneuvering amidst the motorbikes and now also big trucks. We finally give up trying to watch the road and have to trust that the driver knows what he is doing – it’s too unnerving to watch some huge, old rusty truck come barreling toward us. We can’t imagine having to drive like this all the time. We get information about the countryside from our guide as we finally leave the city and find ourselves in farm land. Rice, rice and more rice – along with other vegetables and flat, flat land. Suddenly out of nowhere, sharp, spiky mountains appear like the backdrop of some fairytale. A river winds through these mountains and we stop at their base for the next part of the journey. We board a small boat and are rowed for an hour down the river. All the rowers of these boats are women – I guess all the men are in town looking for work. The women row from the back of the boat, facing forward and pushing the oars through the water – they are very strong. The rower then waits for a couple of hours when we are ready for the return trip - her cut of this is about 1USD, she of course, hopes for something more in tips. The river is beautiful – very shallow with vines and plants growing up through the clear water. 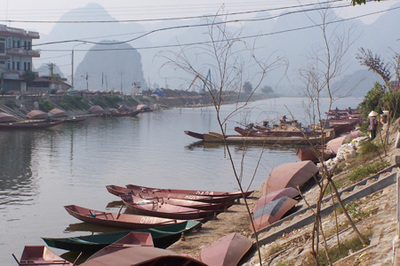 It’s quiet, finally – the first time since we’ve been in North Vietnam. The only sound is the paddle swishing through the water. 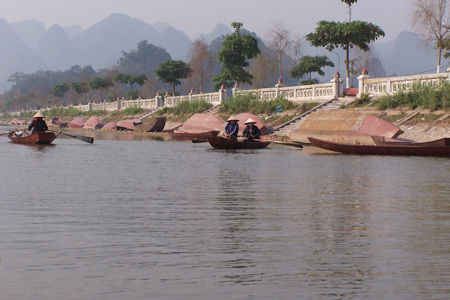 During the season when most people visit the pagoda the river is jammed with thousands of boats – we revel in the quietness with only one or two boats in sight. The Vietnamese grow “wet rice” alongside the river – no need to irrigate. Again women are the ones working in the ‘fields’ which are waist deep in water – they have a rounded pick-like tool that they are using to dig the furrows under the water and the water is cold… We arrive at the landing site and hike up a mountain for about an hour. 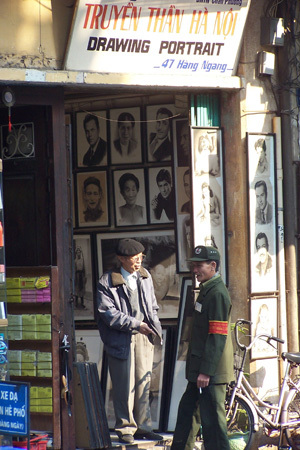 The way is scattered with shops all wanting to sell us a souvenir, a coke, a CD – there aren’t many people around today and business is not good. 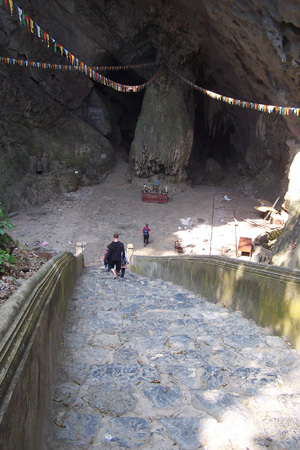 At the top of the mountain is a large limestone cave with altars and statues of Buddha and others. 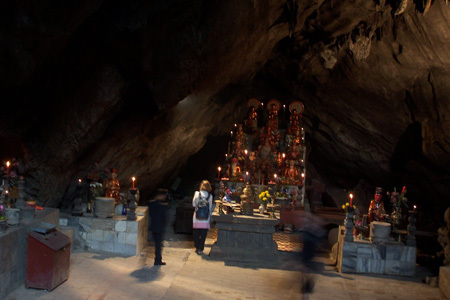 Our guide tells us about the significance of all the artifacts in the cave, how people pray, how to burn the incense – he is very passionate about his beliefs. The area has just completed a tramway to the top of the mountain and we think that it would be fun to take it down and get a bird’s eye view of the surrounding countryside. Hmm… we go up to the top of the tramway and the operator is asleep inside the office. Our guide wakes him and talks to him, but to no avail, the tram is not going to operate right now. 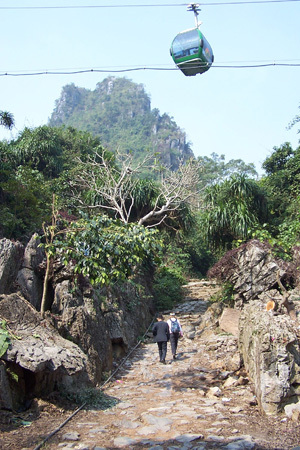 We come to find out that many of the surrounding villagers don’t want the tram – it will take the visitors straight up the mountain and not by all the shops along the way, hence the operator’s refusal to take us down the mountain. It will be interesting to see what happens in the future – our guide is not pleased. So, we walk back down the mountain and do buy a fresh coconut and some postcards along the way. Back at the bottom we have lunch – again hard to imagine if you are thinking in western terms, all cooked outside – rice, veggies, pork, - really good, especially since we were quite hungry! There is an extensive pagoda at the bottom and again our tour guide gives all the details of what we are seeing. 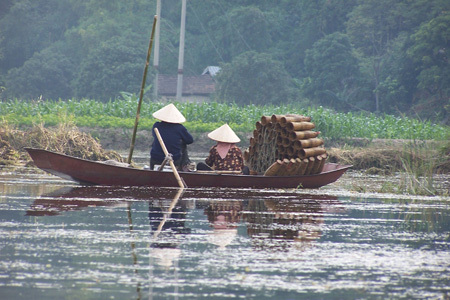 The trip is now reversed – back up the river and back to Hanoi. The pagoda is the site of a pilgrimage that thousands of people make during a certain time of year – I think we got the best of it without all the crowds. 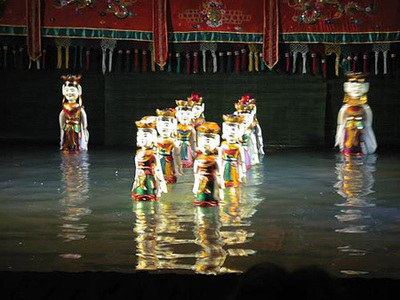 Assorted Activities: We see the water puppet show in Hanoi – a local custom in which puppets are controlled in the water by puppeteers behind a screen (also standing waist deep in water). There are puppets of water buffalo, villagers, dragons, kings – all set to Vietnamese music played by a live ensemble. Can you believe there is bowling alley near our hotel? Real bowling – just like we’re used to – shoe rental, automatic scoreboard - so we bowl a couple of games. 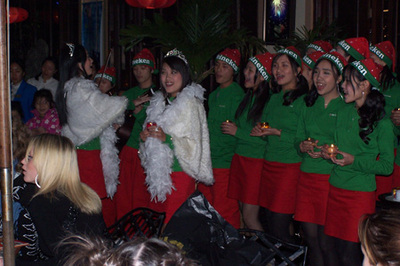 Food: in the “Old Quarter” there are restaurants with English on the menu – in fact we are eating and some Heineken Xmas carolers come in wearing Heineken labeled Santa hats and sing a couple of carols in heavily accented English – Crazy! A remainder of the long French occupation of this country is in - can you believe it? French Bread! Good, crusty loaves are for sale all over this rice nation.The local food is tasty - lots of vegetables and good spices. 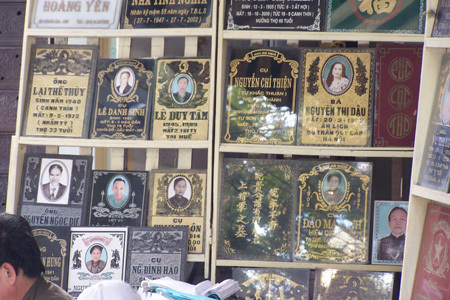 War: We keep thinking about the ‘Vietnam’ war, called the ‘American’ war by the people here. 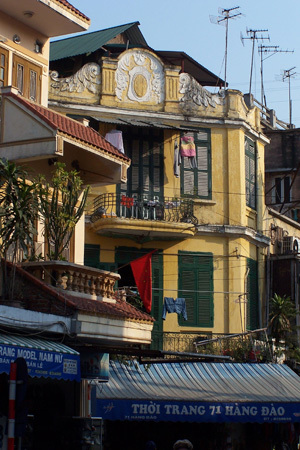 It’s hard to imagine Hanoi being bombed and the horrendous fighting that went on for so many years. 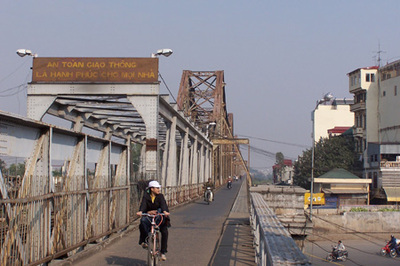 We walk across the Long Bien bridge which was bombed repeatedly during the war and repeatedly rebuilt by the Vietnamese – hence it’s unsymmetrical and patch work structure. We have to wonder what it was all about, so many lives lost, so much energy placed into destruction… War continues today in other places, but for now this one place has had a long period of peace and seems to welcome all foreigners. 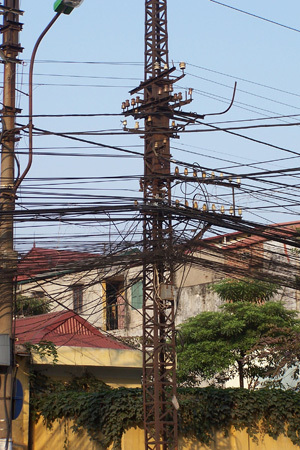 Rebuilding the infrasturcture - one wire at a time! A not-so crowded intersection in Hanoi - motorbikes, cars, pedestrians. This intersection had a stoplight and here they are ready to go! In the "Old Quarter" here is a street alive with action. Looking down on the street activity. 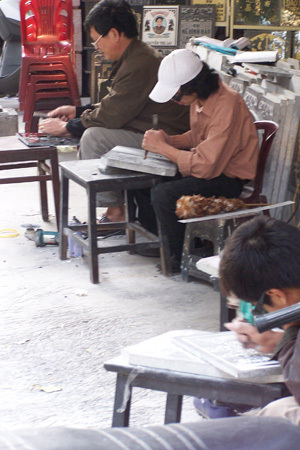 Many industries spill out onto the sidewalk - here are gravestone cutters at work. Here are some of the finished products of the gravestone cutters. Notice the pictures on the stones. Ann in one of the many shops. 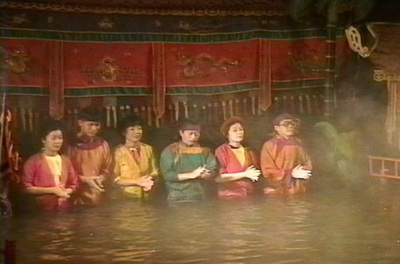 Unique 'theater' with water puppets controlled by puppeteers behind the curtain. Puppets are made out of a hard wood to resist the water damage. Here are the puppetmasters taking a bow at the end of the performance. Talk about a mix of worlds - here are a group of carolers singing Jingle Bells and other traditional songs - sponsored by Heineken beer. 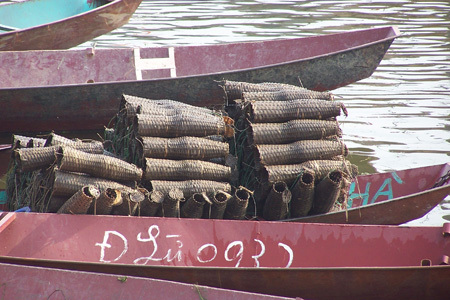 Crab traps in a boat along the river to the Perfume Pagoda. Women rowers waiting for customers to row down the river to the Perfume Pagoda. Boats ready for the trip to the pagoda. During the season when many people make this pilgrimage there can be 4000 boats coming and going. 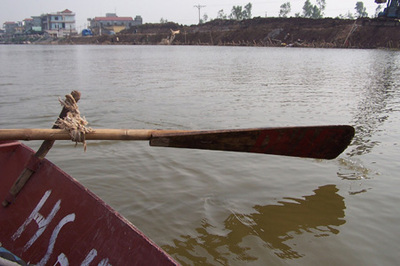 Rowers face forward by pushing the oars for the hour trip down the river. 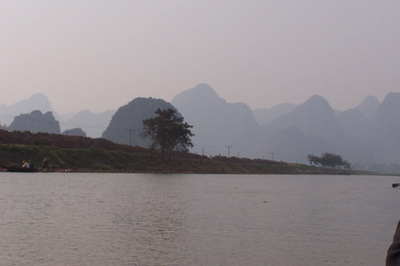 Hazy day but the limestone hills along the river were impressive. Who needs high tech mechanics to make the boat go down the river. 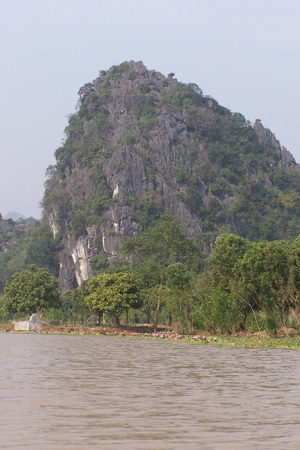 Hills made from limestone along the river to the pagoda. 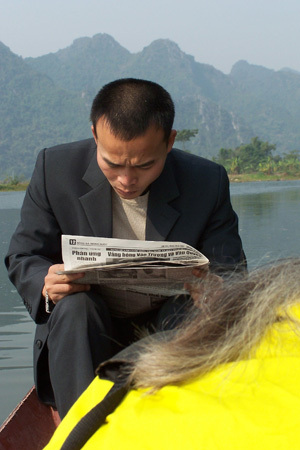 Our tour guide in suit and dress shoes sits of the bow of the boat catching up on the news while we are rowed down the river. Women working along the river. 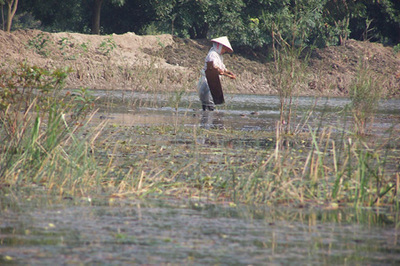 Woman working the wet rice field next to the river in the cold water. 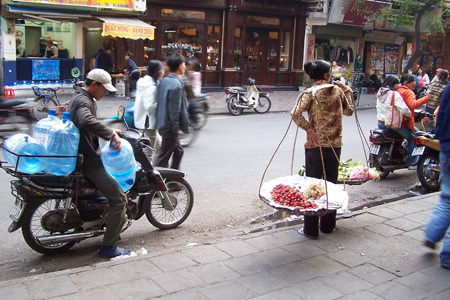 About a 2 km climb up several hills providing ample opportunity for street vendors to offer you their wares. Here is the opening to the shrine inside this big cave. There were more altars as you walked further into the cave. We were lucky to miss all the crowds. 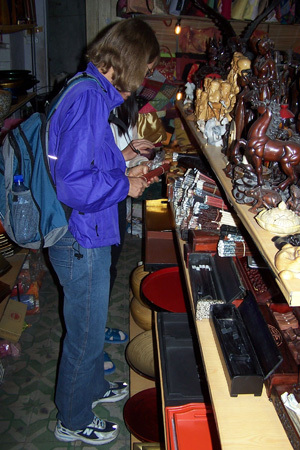 Some of the altars inside the shrine - you can purchase incense to burn. But light only odd numbers of sticks so as not to disturb the yin and yang. 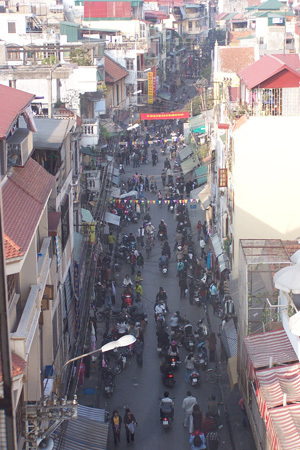 Looking at the outside of the perfume pagoda - the destination of an annual pilgrimage for many Vietnamese. 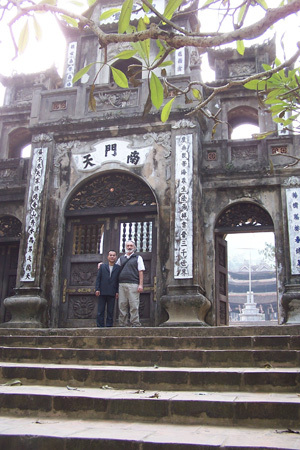 Outside the doorway leading into the pagoda. 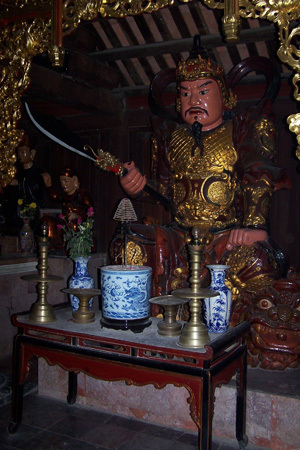 Ornate god inside the pagoda. 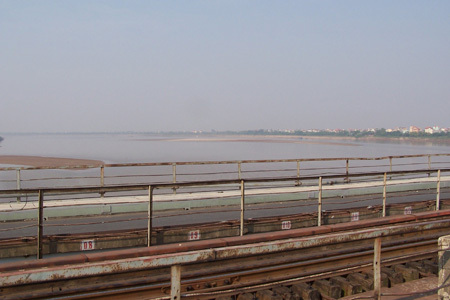 Often bombed railway bridge during the 'Vietnam' war called the 'American' war here. 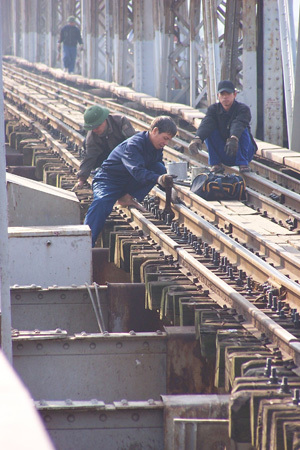 Workers on the railway bridge. 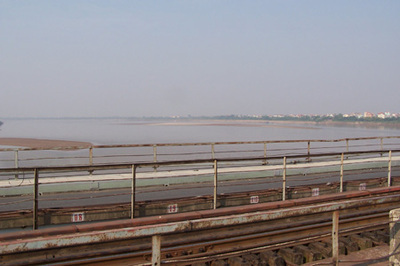 View of the Red River from the Long Bien Bridge. 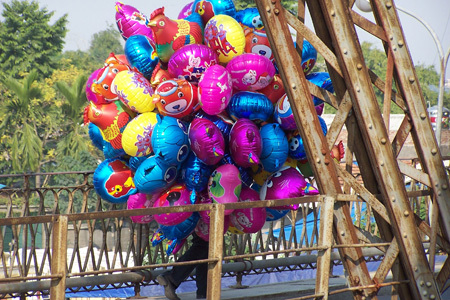 Balloons from one side of the river to the other. 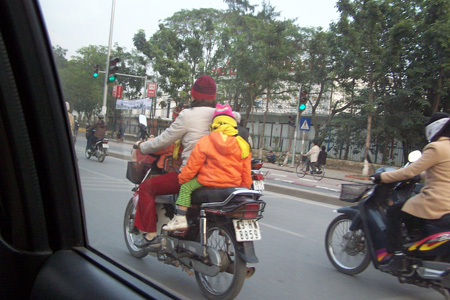 Mom with 2 kids on the motorbike - we were afraid the one on the back was falling asleep. 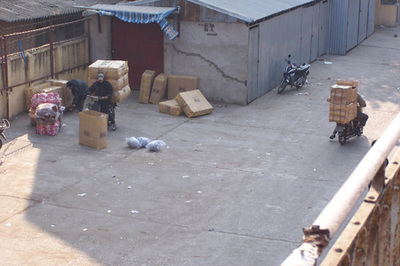 Yup - even big packages are delivered by motorbike. French architecture remaining from occupation by the French. In this rice nation, French bread is a standard - another aspect of French culture that has remained here. 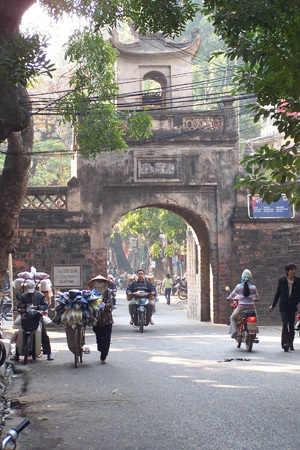 Archway into a section of Hanoi. 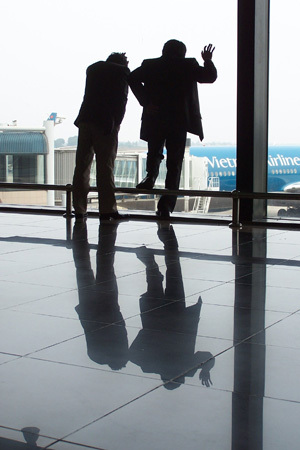 Interesting shot of men waiting for the delayed flight at the Hanoi airport.